Below is a list containing some of the species of shark teeth you might encounter when combing Folly Beach and their common attributes. 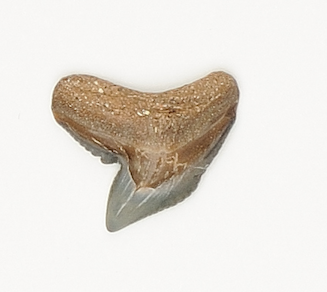 Shark’s teeth are replaced continuously and they can shed thousands of teeth during a lifetime so both shark tooth seekers and shark tooth fairies stay pretty busy. 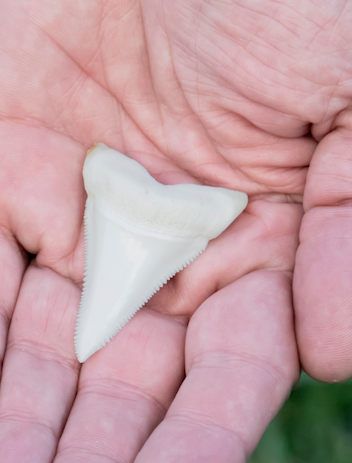 Once you’ve stockpiled your finds it’s time to don your Sherlock’s tweed cap and conduct some shark tooth sleuthing to identify distinctions that will help you determine the species. 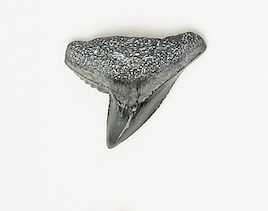 Below is a list containing some of the species of shark teeth you might encounter when combing Folly Beach and their common attributes. Short, deeply-notched blades are the defining characteristic of a tiger shark, which gets its big cat moniker from the dark vertical stripes on its body. The shoulders of the tooth blades also feature sharp serrations the predator uses to crack the shells of clams and sea turtles. Its teeth typically range in the area of 1 inch, but they can occasionally grow to 1.5-2 inches. Having earned a reputation as one of the world’s most aggressive sharks, bull shark’s teeth have tapering serrations and flat and broad blades that narrow toward the top. They are usually one inch long or shorter, and serrations are found along the entire blade, but become increasingly smaller as they go down the blade. Bull sharks are one of the most likely species to attack humans unprovoked, and they are even known to swim into rivers and tributaries. Lemon sharks look nothing like the mouth-puckering fruit in body shape, but they are bright yellow in color, which is where they derive their name. Lemon shark’s teeth are distinguished from other sharks by their lack of serrations and slightly angled, smaller blades. Their teeth are generally about 0.75 inches long. These sharks prefer shallower waters and are often found near coastlines and islands. 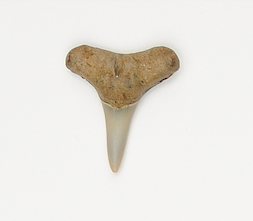 Narrowness and a long crown are the most salient features of sand tiger shark’s teeth. They don’t have serrations along the blade and the teeth cusps are very high and curved. Its teeth usually measure one inch in length. Sand tigers are big and deliberate fish with a flattened, conical snot, but despite their hulking size they are generally not a threat to humans unless provoked. 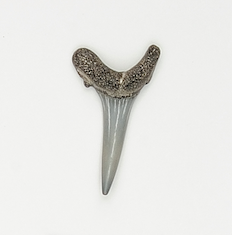 If you uncover a broad and flat tooth that is triangular in shape with coarse serrations along the blade, you may have stumbled upon part of the former jaw of ‘Jaws.’ And there’s no safer introduction to a 1.5-2.5-inch long Great White’s tooth than when it’s lying on the beach separated from the mouth of the largest predatory fish on earth, which can grow to 15 feet on average. Although Great Whites are massive, Megalodons dwarfed them by comparison, with an average length of 33 feet and reaching up to 60 plus feet, they are the largest shark ever documented. This extinct species that inhabited the oceans millions of years ago is a rarer find, but shark hunters do occasionally pluck them from the Folly sand. 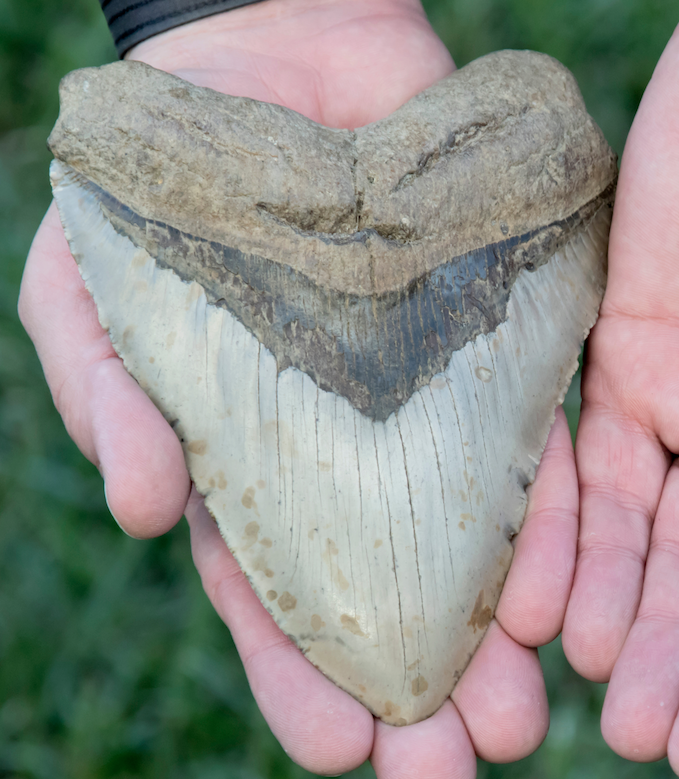 Size is the prominent indicator that a tooth is a Megalodon, as these giants typically range from 3.5-7 inches long. And as a fossilized tooth it will appear much darker in color than more recent finds.